Each home at Madison Grove also includes master bedroom suites, walk in closets, three car garages and kitchens with granite counters. The Bellini home floor plan has a great room with a two story ceiling in a 2,993 square feet home. The home offers a downstairs master suite and three bedrooms upstairs. The Trapani home has an entry courtyard in a 3,244 square feet plan. The main floor has a great room, den and a breakfast room. Two more bedrooms and a master suite with a sitting area are located on the second floor. Botticelli is the largest north Las Vegas home at Providence real estate in Madison Grove with 3,428 square feet with three bedrooms and a central courtyard. The master bedrooms include a room sized closet and a kitchen with a walk in pantry. Providence Las Vegas master plan has a unique theme of American Spirit theme. The park system is named after different baseball and literature elements. At the completion of the master plan in north Las Vegas real estate there will be about 4,000 desert shade trees, 10 miles of trails and 33 acres of parks. 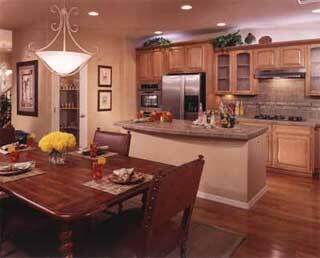 Madison Grove Las Vegas homes for sale in Providence open models.